BANGKOK, Thailand, March 14, 2013 (ENS) – Government Parties to the world’s only wildlife trade treaty today confirmed measures to protect sharks and rays and tropical hardwoods and to take action against countries doing little to stop the illegal trade in elephant ivory and rhino horn. On the final day of the 11-day meeting of the 179 Parties to the Convention on the International Trade of Endangered Species, CITES, the meeting reached a climax when two countries attempted to overturn protections for sharks agreed in committee earlier this week. Japan and Grenada attempted to reopen debate on the oceanic whitetip and hammerhead shark proposals respectively, but both narrowly failed to gain the needed one-third majority. The proposals for the porbeagle shark, freshwater sawfish and manta rays were adopted without objection. 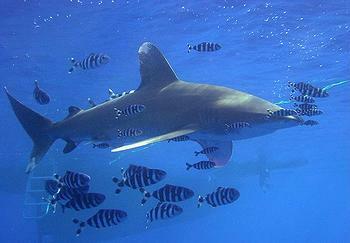 The oceanic whitetip, Carcharhinus longimanus; scalloped hammerhead, Sphyrma lewini; great hammerhead shark, Sphyrna mokarran; and smooth hammerhead shark, Sphyrna zigaena, are harvested by the millions each year for their valuable fins and the porbeagle shark, Lamna nasus, for its meat. 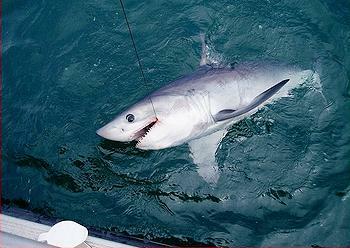 The porbeagle shark received protection after two unsuccessful attempts at previous CITES Conference meetings. Ireland, on behalf of the European Union, presented the proposal and announced an implementation package of 1.2 million euros to help developing countries implement the porbeagle shark listing and protect other marine species. From now on, these five shark species will be listed on CITES in Appendix II, which allows regulated trade. Traders must have CITES permits and provide evidence that the sharks are harvested sustainably and legally. Ecuador’s proposal to list manta rays on Appendix II was adopted by CITES member governments. Manta rays are slow-growing migratory animals with small, highly fragmented populations. They have among the lowest reproductive rates of any marine animals, with females giving birth to only one pup every two to three years, making them extremely vulnerable to overexploitation. Manta gill plates, the feathery structures rays use to filter plankton from the water, fetch high prices in international markets and have been traded in increasing numbers over the past 20 years for use in traditional Chinese medicine. Sellers claim products made from manta gill plates can treat asthma, skin rashes, chicken pox and even cancer, although there is no evidence to support any of these claims. The polar bear, threatened by climate change and trophy hunting, was proposed by the United States for listing on CITES Appendix I, which bans commercial trade, but the proposal failed to get the required two-thirds majority for acceptance. International trade in a range of rosewoods and ebonies from Asia, Central America and Madagascar will now be regulated by the Convention under Appendix II. The new listings apply to Malagasy ebony and Malagasy rosewood from Madagascar, Brazilian rosewood, Thailand rosewood, Black rosewood and granadillo rosewood as well as Honduras rosewood. Rapidly rising demand for these precious tropical hardwoods has led to concerns that unregulated logging is depleting populations of already rare species. Countries where these trees grow, including the host country, Thailand, believe that regulation under CITES will help them manage trade in these precious timbers more sustainably. Cross-border travel of musicians with instruments containing precious woods such as Brazilian rosewood, and other CITES-listed species will be eased by a new “passport” document that identifies the instrument as being in compliance with CITES regulations. A joint program between CITES and the International Tropical Timber Organization will support the efforts of countries to strengthen their capacities to implement the Convention’s regulations for these species. The CITES Convention covers some 35,000 species, from elephants to orchids and from tiger bone to crocodile skins. “CITES Parties have heeded the call from Rio+20 and recognized the important role of CITES as an international agreement that stands at the intersection between trade, the environment and development,” Scanlon said, referring to the United Nations summit on sustainable development held in Rio last June. During negotiations over the past 11 days, CITES member governments decided to establish Wildlife Incident Support Teams consisting of enforcement staff and experts, to be dispatched at the request of a country affected by a major poaching incident related to illegal trade or that has made a large-scale seizure of CITES-listed specimens, to assist and guide follow-up actions in the affected or intercepting country. Strategic decisions were adopted for the first time about on-the-ground actions to collectively address the poaching crisis affecting African elephants, Loxodonta africana, and the escalating illegal trade in ivory. African countries formed an unprecedented united front, setting aside past differences to address this crisis in which tens of thousands of elephants are being poached each year across Africa. Governments mandated that China, Kenya, Malaysia, the Philippines, Tanzania, Thailand, Uganda and Vietnam – the countries of highest concern for their failure to clamp down on large-scale illegal ivory trade – to submit plans to deal with the problem within two months, and make progress before the next CITES committee meeting in summer of 2014. While CITES member states declined to place immediate trade sanctions on these countries, under CITES rules their continued failure to take action could lead to a compliance process that results in future sanctions. Rules for trading in elephants or elephant products were revised, modernized and strengthened by addressing e-commerce, using forensics, monitoring ivory stockpiles and dealing with countries that are persistently involved in illegal trade in ivory. A suite of targeted actions focusing on the 30 countries most involved in or affected by the illegal killing of elephants and the illegal trade in ivory was adopted. 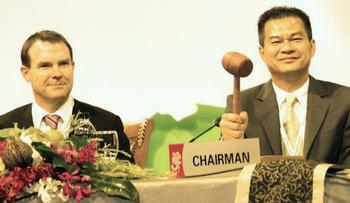 An agreement to continue debating future of trade in ivory, and keep management options open was also reached. An agreement was also adopted to strengthen the African Elephant Fund and the African Elephant Action Plan. The conservation of Asian elephants, Elephas maximus, was also addressed. Countries gave greater recognition to the illegal trade in live elephants and advanced the development of an Asian Elephant Conservation Strategy with all Asian elephant range states by November 2013. The Conference requested member governments to prosecute members of organized crime groups implicated in rhinoceros-related crimes and impose strong penalties that will act as effective deterrent. Those countries should submit rhino horn samples from seized specimens to designated accredited forensic laboratories. Countries were asked to regulate the re-export of rhino horn products and develop demand reduction strategies aimed at reducing the illegal movement and consumption of rhino horn products, which sellers claim treats cancer and cures hangovers. Governments agreed to convene a CITES Rhinoceros Enforcement Task Force to develop strategies to improve international cooperation. Asian countries inhabited by endangered big cats such as tigers were requested to organize national seminars covering protection for big cats listed on CITES Appendix I. The seminars would involve all relevant law enforcement agencies in a multi-disciplinary approach to improve coordination and cooperation in the detection, investigation and prosecution of wildlife crimes. Governments agreed to undertake a study on the alleged illegal trade in live specimens of cheetahs. Better rules were adopted to refine the leopard trophy hunting system. South Africa offered to host the next Conference of the Parties in 2016; delegates accepted South Africa’s offer by acclamation. Proposals: 55 proposals were accepted, nine were rejected and six were withdrawn.